In the village Reteag, at no. 24, there stands a farm-house with porch, built in 1866 and transformed into a museum in 1955. 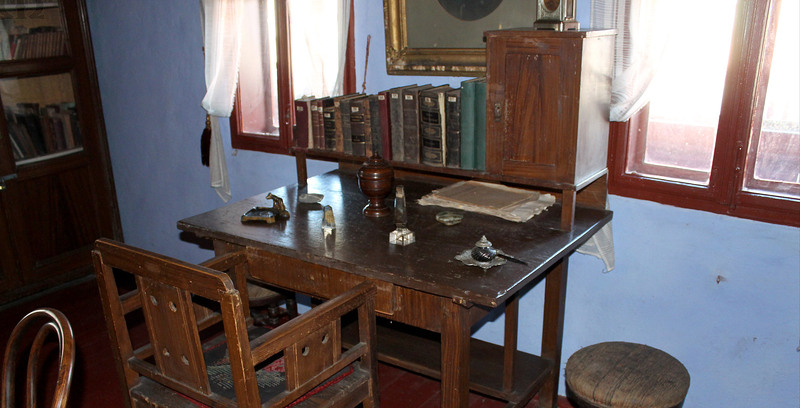 Built by the father of the folklorist Ion Pop Reteganul, the house shelters today some of the objects belonging to this valuable scholar and is the place where Ion Pop Reteganul was born and spent his retirement years. 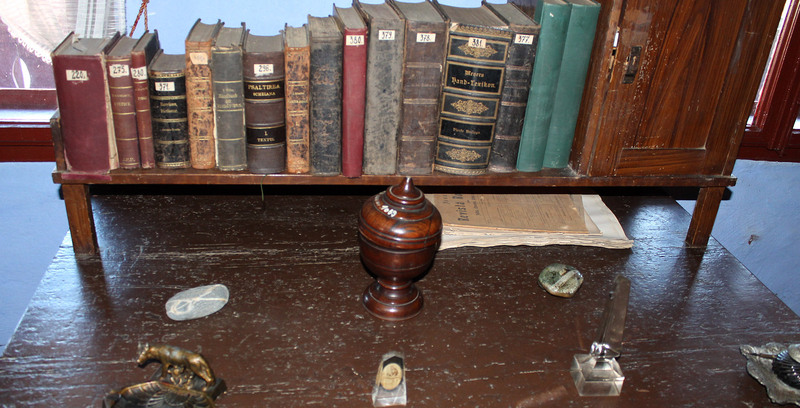 The austere ambiance of the working place of the former school teacher is offered by the bed, office table, table, closets filled with books, mirror and trunk. There are exhibited the books and articles written by him, the magazines he worked at, correspondence files, lesson-plans, translations, papers in manuscript and many others more. Ion Pop-Reteganul (1853-1905 ) was an educator, proseman, publicist and folklorist representative for his time and remained in the history of Romanian folklore as “the greatest folklorist of Transylvania” (Ion Muslea). He was born on June 10th 1853 in the village Reteag, county Bistriţa-Năsăud, a village on the Somesul Mare River, village from which, in order to be able to differentiate from the other Pop names in Transylvania, he took over the pen-name Reteganul. He followed the primary school in Reteag, going to school only during the winter, as once the spring came, he started watching over his family’s sheep grass-eating. He followed two “normal” gymnasium classes and two more at the Border Gymnasium Nasaud (1864-1867). In the fall of 1870, deciding he wants to be a teacher, the starts the courses of the Confessional School in Gherla, and in the next year of the Confessional School in Deva (1870-1871). In February 1873, before graduating, as he was considered an exceptional student, he was asked to take over a teacher job in the village Orlat in the county Sibiu. For twenty years he had been working as teacher in several counties (1873-1892), being preoccupied by gathering the folklore in these regions. In 1876 he teaches in Boru Mare on Jiului Valley, in 1878 in Lisa (Făgăraş), as headmaster of the Romanian confessional school, in 1879 in Bouţarul Superior in the diocese of Lugoj, in 1881 in Bucium-Seasa, in Sâncel then near Blaj (1885), in Rodna Veche (1886) and finnnaly in Reteag, where he retired in 1892. When retiring, he was satisfied because of setting up 5 schools and contributing to the development of others, stating: „to be born again 100 times, I would be every time a teacher, because there is no career more beautiful than being a teacher”. He dies at the age of 52, on April 3rd 1905 in Reteag. His wife, Luiza outlived him almost 50 years, and his daughter Eugenia died a year before her mother. All three of them are buried in the same tomb. In 1878 he published in the magazine of Iosif Vulcan ˝Şezătoarea. Foaia poporului român˝ (Siedietórea. Fóia poporului românu), the story ˝Fata mulţumitoare˝ (“The decent girl”) – a try to versify the story ˝Toarceţi fete, c-a murit Baba Cloanţa˝(Spin girls as the bad witch has died), he will later introduce in the volume ˝Poveşti ardeleneşti din popor adunate˝ (Transylvanian stories gathered from the folk), part 1 (edited in five parts), 1888, volume that became very popular. Vasile Alecsandri wrote to him from Paris, that he read them “with great pleasure” urging him to continue the “precious gathering and publishing, meant to have an important place in the thesaurus of popular literature, fulfilling this way, one of the most useful missions of a man who loves his people”. He also edited the folklore books: ˝Little heart – that is the Pearl of national poetry, of the best Romanian writers, for the use of the Romanian youth˝ (1885, 2nd edition in 1907), ˝Roses and Violas˝ (1886, 4th ed. in 1912), ˝Boys’ whistle at the dance, Anecdotes to be shared to the people˝ (1887), ˝Ceremony master or the folk customs at Transylvanian weddings˝ (1890), ˝Tales of the folk˝ (1895, edited under the patronage of ASTRA and rewarded by the Association), ˝Laments˝ (1897), ˝The Romanian in the village and in the army, appreciated because of his folk-songs˝ and ˝Pântea the Brave: traditions, legends and historical sketches˝ (1898), ˝The building of the world. Adam and Eve. The origin of the Holy Cross and the 12 Fridays: according to folk-traditions and old manuscripts˝ (1901, 9th ed. in 1915), ˝From the mill: stories and anecdotes˝ (1903) etc. Among the original writings, we mention the prose volumes ˝Tales and sketches˝ (2 vol. 1898-1899), ˝Examples and guidance for the folk˝ (1900), ˝Tales˝ (1901), as well as a ˝Reading book for the final years of the normal schools, repetitive schools, courses for adults and for our folk˝ (1892), a practical course about fruit-farming (1889, 1904). He handed over to the Romanian Academy 21 volumes in manuscript, a committee has analyzed the materials in view of publication, but the majority will remain unpublished. He was editor at the publications: ˝The books of the Romanian villager˝ (Blaj, 1886), ˝The Righteousness˝ (Timişoara, 1893-1894), ˝The Awakening˝ (Cernăuţi, 1897) ˝The illustrated Magazine˝ (Reteag, Şoimuş, 1898-1899), ˝The Tribune˝ and ˝The Folk-Paper˝ ( Sibiu, 1899-1901), ˝The Sunday Gazette˝ (Şimleu, 1904-1905), also publishing a part of his folklore texts. He developed an intense activity in the theoretical field of folklore gathering in the pages of the magazine published in Iasi “The Contemporary”, in “Transylvania Gazette˝ (Braşov), ˝The Gutin˝ (Rodna) etc., and wrote articles concerning history of education. 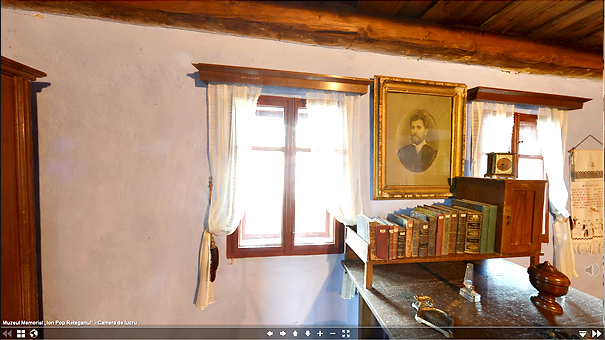 In Sâncel, together with the publicist Petre Stoica, he edited the magazine ˝Pedagogical Speeches˝ (1886-1887). He was vice-secretary of the “Association for the Literature and Culture of the Romanian People˝(ASTRA) in Sibiu (1893-1896). He was especially appreciated by the most prestigious scholars of his time: Vasile Alecsandri, Octavian Goga, B.P. Haşdeu, I. Bianu, I. Urban Jarnik, Gustav Weigand, Nicolae Iorga. The main published volumes: Ion Pop-Reteganul – Roses and Violas: folk poems – Gherla, 1884. Ion Pop-Reteganul – Little heart – that is the Pearl of national poetry, of the best Romanian writers, for the use of the Romanian youth. – Sibiu: Ed. Krafft, 1885. Ion Pop-Reteganul – Transylvanian stories: in 5 parts. – Braşov: Ed. Nicolae I. Ciurcu, 1888. Ion Pop-Reteganul – The Fairy Queen: Transylvanian Stories. – Bucureşti: Minerva, 1970. – 310p. Ion Pop-Reteganul – What if there would be no stories. – Sibiu, 1971. – 180 p. Ion Pop-Reteganul – Folk-tales. – Timişoara, 1989. Ion Pop-Reteganul – Water Fairy: Transylvanian Stories. – Bucureşti: Minerva, 1997. – 310 p.